Scottish author and physician who introduced the legendary character, Sherlock Holmes, in A Study in Scarlet (1887). Although he began a medical practice in 1882, it was his writings that became his career. Late in his life he became interested in spiritualism. In Report, from the Select Committee on the Daylight Saving Bill (1908). Science Quotes by Sir Arthur Conan Doyle. 22 May - short biography, births, deaths and events on date of Doyle's birth. 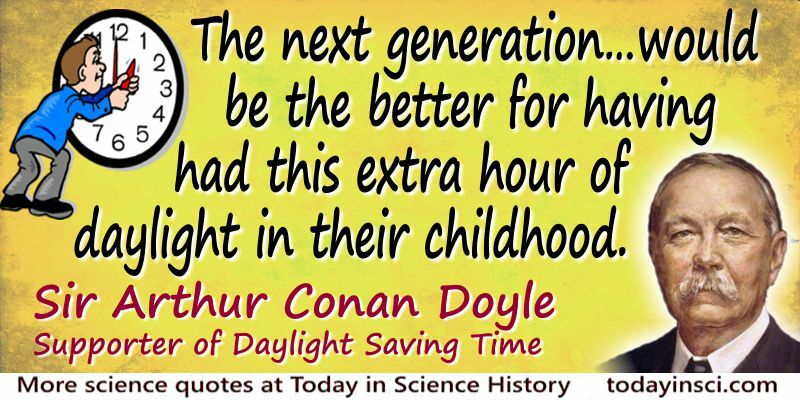 Sir Arthur Conan Doyle gave evidence on a proposed Daylight Saving Bill to a Parliamentary Select Committee hearing witnesses. Booklist for Arthur Conan Doyle.